For example, he convinced a family struggling to pay their mortgage to move out of their home and into one his other properties; he then rented their home out, collecting rent from the tenants without paying the homeowner’s mortgage. Another tactic involved convincing homeowners that he was trying to negotiate with their lender on their behalf. Instead he would damage their property to decrease its value, and once the home was damaged, he’d buy the home in a short sale—a term for a property being sold at a price lower than what is owed on the mortgage. Hussain also solicited investors to purchase properties they never intended to live in, telling the victims he would rent out and manage the homes on their behalf. He did not actually make the mortgage payments, defrauding the homeowners and jeopardizing their credit scores. Hussain pleaded guilty last September to aggravated identify theft and conspiracy to commit wire fraud. In January, he was sentenced to 13 years in prison. “They won’t get their money back, but the victims were pleased with the sentence, knowing that he can’t do this to anyone again anytime soon. It gives them some closure,” Grady said. Grady and Brekenfeld recommend doing your homework in any real estate transaction, especially if someone asks you for significant cash up front or promises any sort of guaranteed returns. Legitimate investments do not offer guarantees. 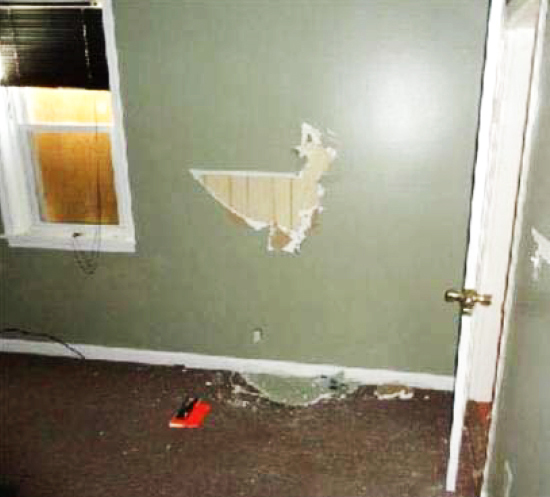 This damaged wall was in the home of one of Hasan Hussain’s victims. In some cases, Hussain convinced his victims to move out, and he would then damage their homes to reduce the values.